1 The 406DUO uses advanced Synchronous buck-boost DC/DC converter technology, high power, a high current and high-performance power conversion circuit. The maximum charge power capacity is up to 1400W, the maximum charge/discharge current of a channel is up to 40A, andtwo channels in Synchronous Mode are up to 70A. 2 Each channel supports 6s LiPo, Lilo, LiFe and NiZn batteries, with maximum 1.2A balance current, and adopts a unique balance calculation of internal resistance correction. Supports 1-20s NiMH/NiCd batteries and 1-12s Pb batteries. 3 With 1A/5V USB charging port, convenient for the user to charge mobile phones and PCs. 4 When the channel output connects the battery after the charger powers on, it will start automatically the anti-sparking protection. 5 Intelligent fan control. Sensing internal temperature via the internal temperature sensor, to thereby control the fan speed. 6 Internal temperature protection. When the internal temperature exceeds the Power Reduce temperature, the output power is automatically reduced; and the charger will shut down when temperature exceeds the Shut-down temperature. 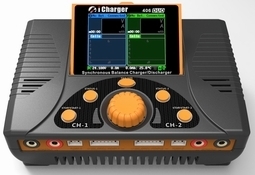 7 This charger can save 64 parameters sets and support the data import/export to SD card. 8 A 2.8-inch LCD screen provides rich information including current, voltage, power, capacity, internal resistance, control status, time-consuming and temperature, etc. 9 Multi-discharge features: self-discharge, regenerative to input discharge, and lithium battery extra expanding discharge. 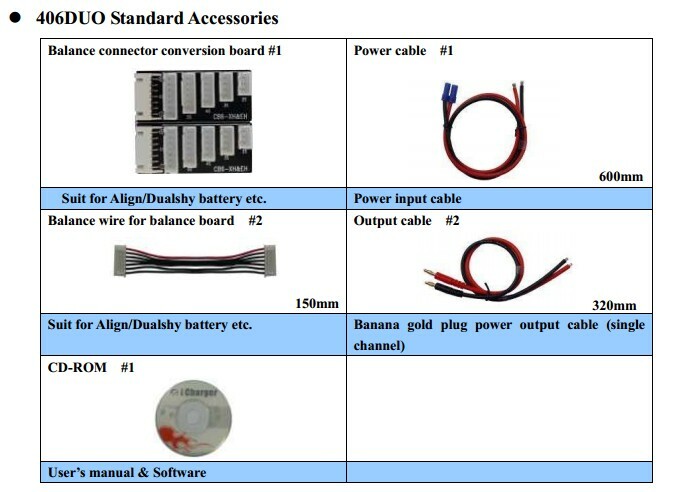 10 Supports measurement for internal resistance of battery offline and online. Can measure not only the internal resistance of the entire battery pack, but also measure the internal resistance of each cell within the lithium battery. 11 The iCharger has protection for reversed polarity (input or output), input voltage/current, battery temperature, charging capacity, overrun time and maximum power etc.